Google I/O is Google's annual developer conference, where they share the latest products and technologies. We're bringing the I/O experience to different cities Google I/O Extended Roadshow, a series of talks and workshops to help professional and student developers deep dive in the new technologies announced during Google I/O 2016. We're still finalizing the agenda, registration, and other details. 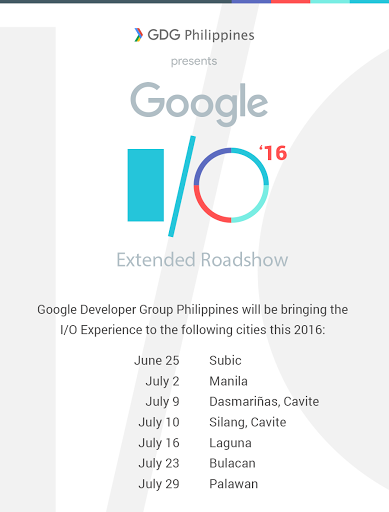 Please add GDG Philippines in your Google+ circles and check http://ioextended.gdgph.org for updates about the event.